I’ve found it! The bloody mary cocktail that I can’t get enough of. Crazy, right?! The best bloody mary recipe that I’m actually into is not something I thought I’d find this summer. And who would have ever thought a bloody mary could be SO pretty? It’s no secret that I don’t loooove bloody marys. For years I’ve documented my distaste for tomato sauce that started (or just… existed?) when I was a kid. I’ve never loved anything tomato-sauce based. At all! But bloody marys have also been my “coffee” of this decade. And what I mean by that is that I WANT to like them. I mean, I want to love them. I want to sit at brunch and order a bloody mary that has all kinds of stuff on top, like tacos and pizza and cheeseburgers. Or heck, I’d even be happy with just bacon and olives. P.S. my favorite bloody mary on the internet is this green monster version. Isn’t it amazing?! Another reason for my complete horror at bloody marys is because they tend to have soooo much celery in them. And celery is the worst. It’s something that I’m almost positive I will never enjoy. The only thing coming in at a close second is fennel seeds. And then raisins, of course. Oddly enough, I don’t really mind celery salt. Because it’s not so much the flavor, it’s the texture and/or the weird stringy crunch of the veg. So don’t yell at me: you will find a touch of celery salt here! Oooooh. Anyway! The thing is that when I was pregnant with Max, I kind of got into tomato saucy things. It was minimal, of course, compared to others. But it stuck. And then I developed the recipe for our favorite Bolognese in The Pretty Dish. And I can say with certainty that it’s probably one of my favorite recipes of all time. I could even eat it weekly! When I gave bloody marys another try, I realized that as long as I was in control of the base, I even semi-enjoyed them. That meant using tequila instead of vodka and that led to the twisted bacon bloody maria in The Pretty Dish too. OMG – now that is celery-free heaven. Inspired by all the stunning gem heirloom tomatoes here (we have the best tomatoes ever in PA! ), I wanted to make a fresher base with an heirloom juice. I envisioned it to be just like a fresh rainbow juice that swirls together, and I was right! That takes a little extra work, meaning you blend the colors of tomatoes separately (really just for fun, you know? ), but the end result is so fresh and pretty. Then it’s combined with some spices and seasonings that sauces that you’d normally reserve for something savory. Finish it with a smoked paprika rim. And it tastes GOOD. 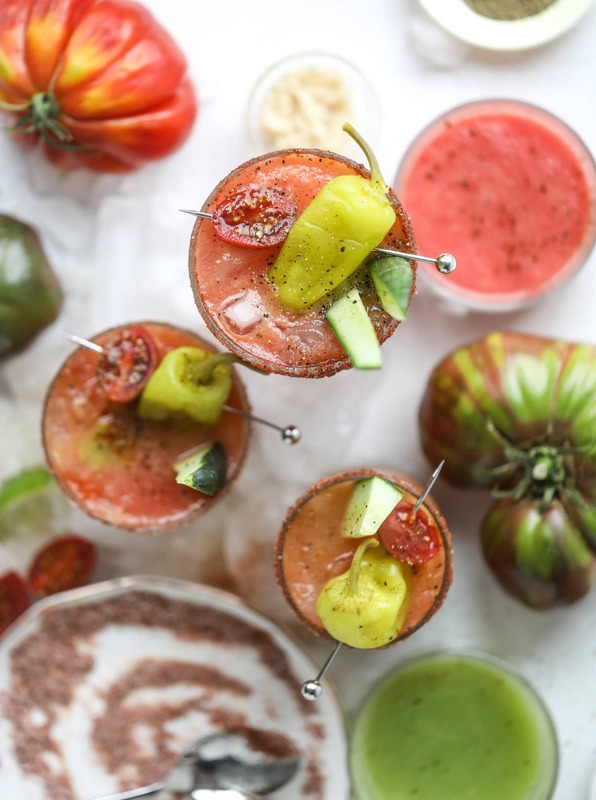 Fresh Heirloom Tomato Bloody Mary's are the freshest update on this classic drink. Using seasonal heirloom tomato juice, these make a beautiful rainbow in a glass! To make the juice, blend the lightest (in color) tomatoes until pureed and blended. Strain the mixture through a fine mesh strainer into a large measuring cup or glass. I started with the green, went to the yellow and went to red. I seasoned each of the juices a bit with salt and pepper, but didn't do much more since the bloody mary has so much flavor! Stir together the salt, paprika, chile powder and pepper on a plate. Rim the glass with a lime wedge and dip the rim in the salt mixture. Fill the glass with ice. In a cocktail shaker or blender, add the tomato juice, lime juice, pickle juice, Worcestershire, celery salt, garlic powder, pepper and hot sauce. Shake or blend until combined. Pour over the ice and stir in the tequila. Garnish with a pickle or cucumber, a pepperoncini and cherry tomatoes. Reeeeally complements some fries. And a cheeseburger. these are the most gorgeous bloody mary’s i’ve ever seen! that color! i loooove a good bloody, and these look like such a fun, fresh twist on them. definitely trying! also, if you like gin (it’s very polarizing, I know), try one with gin instead of vodka or tequila. it gives it a kind of herby/lighter feel, and it’s prob my favorite booze for bloody mary’s. i do like gin!! i will have to try that next. I’ve made the same bean salad for the last 4 weeks and it’s got TONS of celery in it and I cannot get enough. I think the key is small slices! My mouth is seriously watering right now! These look incredible, and they are so gorgeous!! Wow! 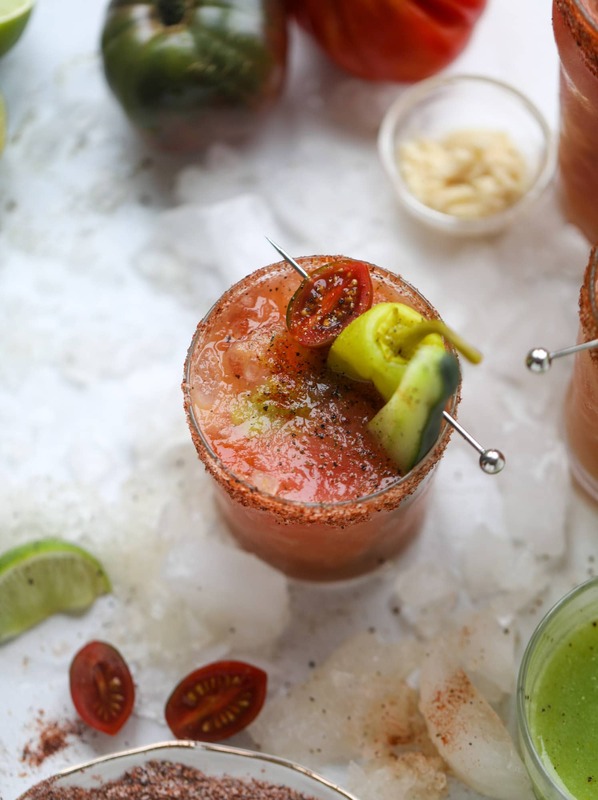 What a wonderful idea to make bloody marys from fresh tomatoes! I love the colors of your bloody marys! I cannot wait to try this recipe! I’m going to have to make a trip to the store after work today! It’s 6:52 am and I’m drinking coffee but wishing I was drinking this gorgeous morning libation instead! Cheers to you for creating this and to the farmers for growing the beauties used to make it! A Bloody Mary has beer in it. This recipe you call a Bloody Mary is actually a Canadian Bloody Caesar which us Canadians have been drinking for decades. You should cut out the garlic as people you are drinking with may not want your garlic breath. hmmm… nope – a bloody mary definitely has vodka in it here in the USA. a michelada has beer. I have been to the U.S. thousands of times and have asked in different restaurants and bars for a Caesar and not one bartender knows what Clamato juice is (which is what we put in ours) and when asked for a Bloody Mary I get the yucky beer in my drink. This is my experience in my U.S. travels which is extensive. I always ask for my vodka and Clamato juice drink because it is my favourite. What city do you have vodka in your tomato drinks because I will try one in your city next time I am in the area? wow, impressive tweaks here and I don’t even mind the classic version, but have to agree with you, although more mildly, about celery, it serves no purpose, the texture IS awful and it’s way too watery, also by the way don’t like raisins, ha, but really like the tequila for vodka swap, thank you for a very inspired cocktail! The perfect summer happy hour drink! Waw! 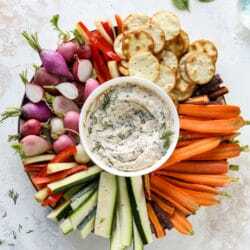 this is looking soo fresh and yummy.